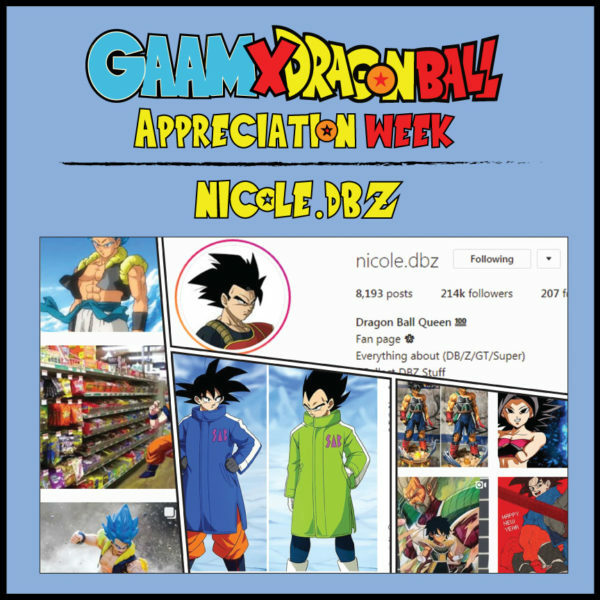 In keeping up with our Appreciation Week, I asked Dragon Ball super-fan Nicole some fun questions to delve into her love of the series. What I got in reply was a very candid look into the early moments of her life and how Dragon Ball has been there all along. Nicole: I have so many memories from DB it would take me days to list them all. One in particular is when kid Goku meets his Grandpa again. That was so sweet and emotional for me, I always cry and feel so much happiness for him. Nicole: My favorite character is Goku. 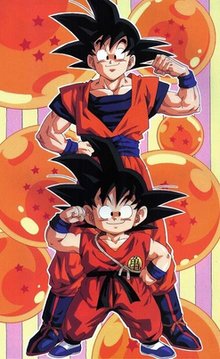 I was only 5 when my big brother was trying to get me into anime, he would keep me there all day watching Dragon Ball. It was Kid Goku who I first saw and I amazed at what my eyes were seeing. He would make me laugh, make me hungry and even intimidate me. I was so into it and his adventures were part of my everyday life. Goku being a sweet innocent little boy won my heart. Goku has been an inspiration for me my who life, I have to say that I owe him a lot and I thank him for everything. He is so funny and he is the hero that we all need. I always wanted to fight like him so I started training. He has been in my life since I was a kid and I don’t consider him just a character. He is a lot more to me. Even my first crush was Goku, and still is and will always be. Me: What motivated you to create your fan page? Nicole: All this time I have been collecting Dragon Ball stuff and all day I would be talking about it or watching it. When I joined Instagram I wasn’t actually planning on being a fan page or was expecting to become this big. I started first as a private account and I was sharing my everyday life, my figures, art and memes. Eventually I started making animated music videos and many other DBZ pages started to share my stuff. I was meeting new fans everyday and that me decide to start a serious and dedicated fan page. My whole day and life was about DB and I thought to myself it would be awesome to share my love and passion with other fans. Everyday i would be creating edits, AMV’s, buy DB stuff, shard videos and art all to share the best of my Dragon Ball world. My page went viral and I wasn’t expecting it at all. I am so happy that everyone enjoys my page and that we can all share this connection when it comes to Dragon Ball. I meet great friends and wonderful people who support me and my page. Without them this page would have never have been possible. Me: How do you keep up with all the Dragon Ball updates out there? 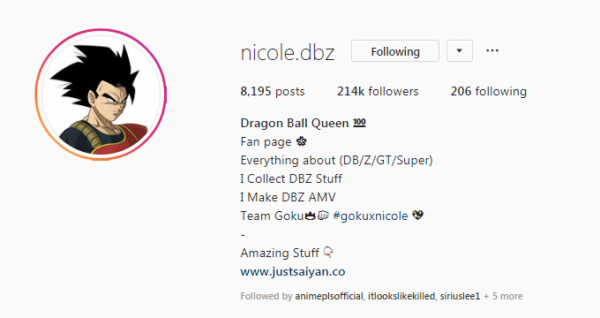 Nicole: I try my best to keep up with everything in the Dragon Ball world. I have had this page for 3 years now and two years go I had so much more free time and was highly active. This past year I have been more busy and going through a lot of stuff. But, even after all that nothing has stopped me from keeping this page alive – that’s how much I love Dragon Ball and care about my followers. I will never let them down, and i will never stop sharing my love for Dragon Ball. Nicole: I don’t think I would be good at voicing a character, but I would love to voice Chi Chi. She is my favorite Dragon Ball girl and I love her. Nicole: I am team Gogeta; there really is something special about him, but in a way they are the same. You can’t say that you dislike one and love the other , it just doesn’t make any sense. I don’t understand how there is a “war” between the fans, it really is stupid in my opinion. 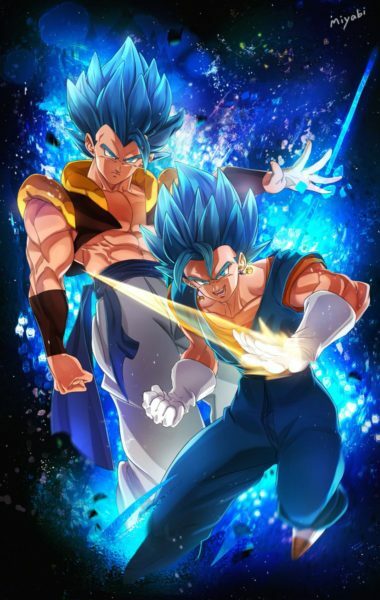 But I personally like Gogeta more, because of his attitude and I like his outfit and attacks better. He really does come off more badass than Vegetto, but that is just my opinion. I don’t know how to explain it but Gogeta just really gets me hyped. I really want to thank Nicole from the bottom of my heart for opening up and sharing her feelings on Dragon Ball with us. As a fellow female fan I know how tough it can be out there in this fandom, and having her as a peer has been inspiring. Dragon Ball is one of the few things out there that everyone can get behind and share as fans.